Got an upcoming event? If so, ticket sales are probably top of mind. While you’ve likely got a good foundation of prospective participants thanks to repeat attendees, email lists and partner outreach. But, even those event pros with robust outlets and other targeted platforms often still find themselves with a significant gap between today’s sales and where attendance ultimately needs to land. No matter the type of event or conference you’re hosting, there are countless sites and industry platforms that welcome listings and other targeted promotions. From sites that specialize in events — think BizBash, for example — to niche B2B outlets targeting insiders and executives in a specific field, it’s easy to cast a broad but, still, relevant net for little or no cost. Many simply take submissions or planners can enter their event info on line and can post with a few quick clicks. Whova takes much of the legwork out of event promotions. While creating your event app you’ll have the opportunity to opt-in for a specific Whova package based on your unique needs, timing and other key components. Depending on the program you choose, Whova will keep your conference listing in its event directory for at least six months, putting your program front-and-center before thousands of users — users with great influence, access and authority to drive ticket sales, personally and within their extended audiences. Got a database of past attendees — or, even, attendees from your other programs and conferences? Reach out! People love to be in-the-know especially when it comes to their particular field or area of interest. Thank them for attending your past event and tell them you’ve got something coming up that seemed like a perfect fit. To drive even greater engagement, consider offering an exclusive discount, upgrade or other VIP add-on for return participants — no matter the nature of your event or industry, people love to be acknowledged for their ongoing loyalty and support. Like any website, it’s important to integrate smart, strategic local SEO keywords and phrases on-page and in your PPC efforts. Nearly two-thirds of online searches are tied to local brands, businesses and other area information. Integrating high value and, even, long tail keywords will help boost your search visibility and, with it, the likelihood the right people see your message at the right time. Research keywords online or with the free Google Keyword Planner, then start by adjusting your site and landing page copy to integrate the terms your target attendees are searching for. 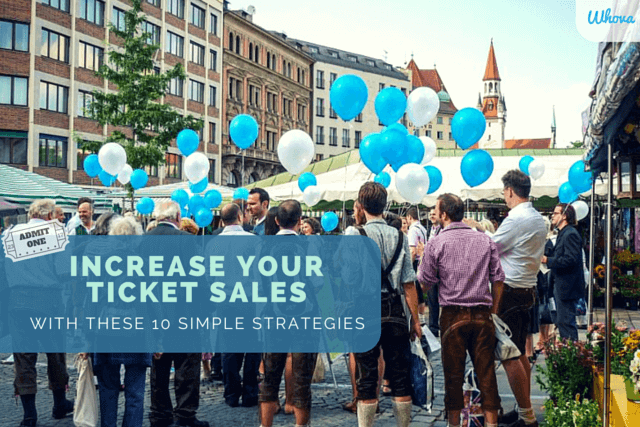 Boosting ticket sales with a discount or promo code is nothing new, but identifying ways to lend value to you and your attendees can be a major win for both sides. Early bird specials, for example, as well as group discounts are great promotions to start with. Incentivizing early purchases helps create a sense of both urgency and scarcity, while giving your event a boost right out of the gate. Group sales are also simple go-tos as they incentivize companies and other organizations to send multiple attendees, filling your event or conference without any added resource or budget allocations. Is there anything more powerful than word-of-mouth? Tap some of your past or current event attendees to help spread the word about your upcoming program. The upside for these influencers? It could be free tickets to a future or something of equally high value — think travel or hotel accommodations for the event, or other VIP perks. Got a Facebook page, Twitter feed or Instagram account? Be sure you’re tapping these socially-driven sites to get the word about your event. Not only do they come with a host of free and low cost advertising and marketing solutions, but there’s always an inherent virality each time you post — with a quick click your audience can like, comment, click to buy or, even, share with a friend or group. And, done right, that can mean a significant increase in ticket sales with no added legwork. Have a high site bounce rate? Or, simply, site visitors who hit the site but don’t buy — at least not right away? Think retargeting. These simple, low cost digital campaigns target your message, ad or offer to people who have visited your site in the past — typically the past day, week or, even, month. Ads are served up when they visit other sites with your retargeting vendor’s network, reminding prospective attendees to stop delaying and start purchasing! There are many companies that offer retargeting opportunities, or you can tackle your own campaign via Google AdWords. Another retargeting platform? Social media. Campaigns can be targeted to Facebook, for example, with your message popping up in users’ feeds or sidebars. No matter the outlet you choose, be sure your message is only shared with those who don’t convert. Not only is there no sense in trying to convert those who have already purchased, but it can be a major drain on your promotional budget. Site visitor about to close out of the event landing or purchase page? Integrate an exit intent pop up to keep that prospective attendee on his/her conversion journey. Services like OptinMonster, Thrive Optin and others offer budget-friendly self-service tools to help brands and event planners create a compelling pop up that only shows when visitors are about to leave the site — in other words, when they show “exit intent”. Your pop up should include a powerful call-to-action designed to re-engage prospects in the path to purchase and encourages immediate action — a limited time offer, special incentive or, simply, a reminder that they’ve only got a few day or hours to buy. Discounts tend to be the most compelling add-ons to an exit intent pop-up — those tied to shopping cart abandonment can boost revenues 10% or more. You’ve likely tapped event speakers and sponsors for a reason — they’ve got a broad appeal, a significant following and/or are influential industry insiders or go-to brands/thought leaders. Leverage these partners to generate buzz and ticket sales for your event. Ask presenters to spread the word about your event via social media. Suggest sponsors integrate a call-to-action driving ticket sales within their upcoming eNewsletters. See if your venue will promote to other event pros or, simply, share flyers or other promotions onsite and online. If possible, offer exclusive promo codes or purchase incentives these partners can share with friends, fans and followers — brands and personalities are always looking for perks to share with their audiences. Now we want to hear from YOU! Have you tried any of these tactics in your own event promotions? How did they help you boost ticket sales? Got any others event pros should try?